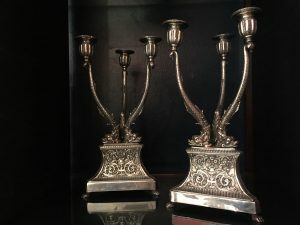 Silver & Silver was established in 1989 in Bologna, Italy by Marinella Veronesi and her husband Antonio D’Ortona, who previously had an antique shop opposite Harrods in Knightsbridge, London since 1972. From 2008 the atelier has been located in via Fusari, Bologna, creating an environment where culture meets art, and becoming the official Buccellati retailer in Bologna. The artworks, from the 17th century till the present day, including antique silver, rare and precious objects of vertu, come from the expert acquisitions of Antonio D’Ortona, one of the most accredited buyers in the international market, including major auction houses.